At 30” or 22″ tall, the round Mammoth Fire Pit table is the ideal centerpiece for your outdoor patio area. The beautiful stone or stainless steel top with enough seating for six sets is perfect for everyday outdoor dining or relaxing. This table makes a great addition to community dining spaces or your patio or porch bar area. The Mammoth stone top is fabricated from 3 sections of your granite, quartzite, marble, Dekton, or Neolith of choice. 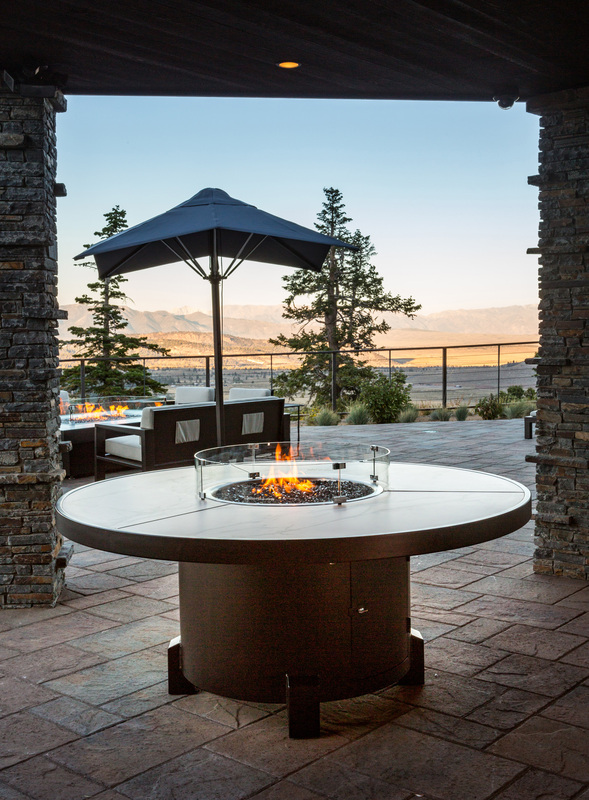 This table top has edges that are wrapped in stainless steel and reinforced to create a rugged, ultra-durable fire pit table. We’ll powdercoat the steel wrapped edges to match or compliment the color of your table’s powdercoated base. 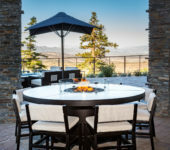 The Mammoth fire pit table comes standard at 72” in diameter and 30” or 22″ high however it is available in any custom size to fit your project needs. 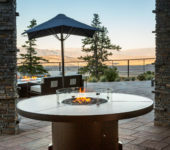 The base of the Mammoth fire pit table comes in 304 stainless steel or alloy with Brushed, Electro polish, Copper, powder coat and other custom options. The base features hidden extra wide leveling feet for patios and porches with uneven, concrete, tile, or wood surfaces. Fill the center of your fire pit with the media of your choice. We’ll supply broken glass, lava rock, tumbled lava, or ceramic decorations. 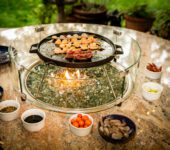 This amazing fire pit comes in several fuel options the most common being natural gas or propane. The propane cylinder hides in the base of the table and regardless of the fuel source, there are no unsightly hoses or tanks outside of the table. This table comes with a stainless steel flame adjustment knob and an optional all weather electronic igniter. 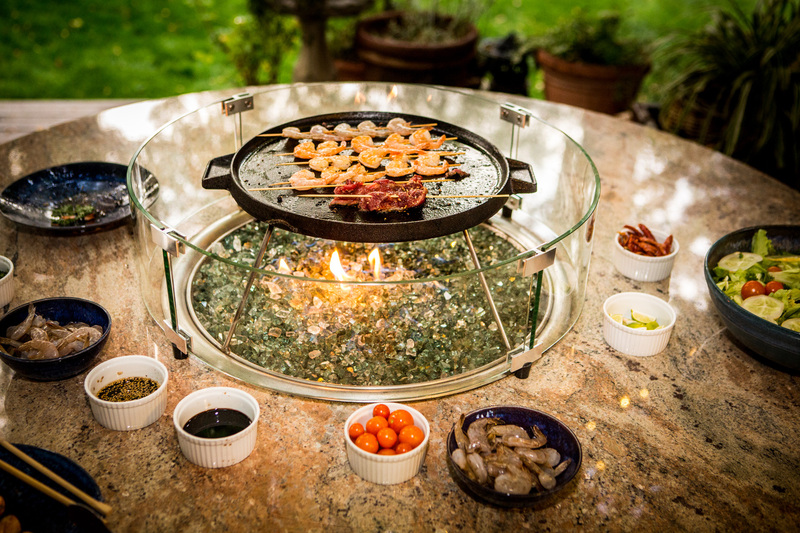 We’ll also include a free stainless steel fire pit lid which elegantly conceals the fire pit when not in use. 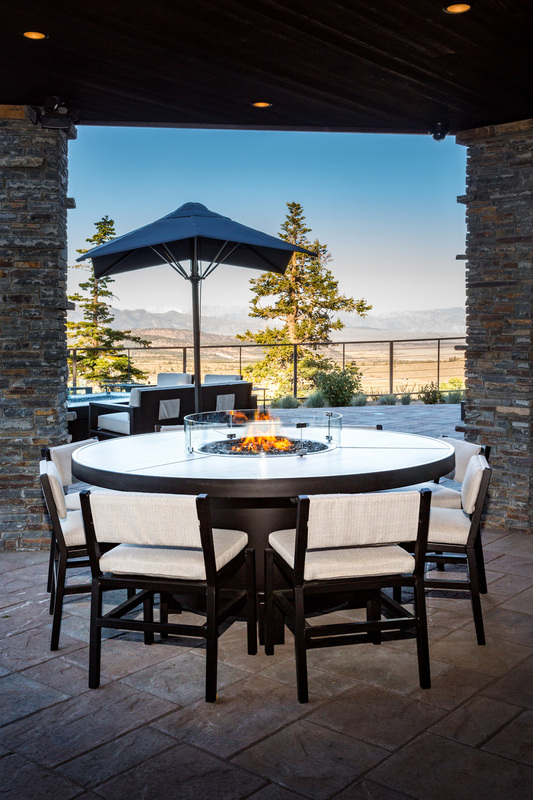 The Mammoth is a beautiful round outdoor fire pit table for everyday dining and outdoor use. Call COOKE now with your design or for more information on fire pit and furniture sets!